The beginning of 1L year can be tough – for three weeks we delved into Bluebook citations, criminal law, contracts, and torts. In addition, we were introduced to the judicial system and the mechanics of both criminal and civil litigation in our Litigation Basics class. Over the course of nine classes, we learned about the procedure involved while taking a case to trial and even drafted a hypothetical complaint. Throughout the course, we enjoyed hearing Professor Jacobsen’s “war stories” about his own experiences as a litigator. To celebrate “completing our first law school course”, Professor Jacobsen took our class to visit the James A. Byrne United States Courthouse in Center City. The courthouse was impressive, and it was very exciting in particular to visit the Third Circuit Court of Appeals. Seeing the courtroom gave us the opportunity to apply everything we learned in Litigation Basics about courtroom procedures, including where each party sits during a trial. At the courthouse, we got to meet the Honorable L. Felipe Restrepo, Judge of the Third Circuit Court of Appeals and his law clerk as well as the Honorable Mitchell Goldberg, Judge of the District Court for the Eastern District of Pennsylvania. Judge Goldberg, a Temple Law alumnus, was pleased to hear about the Litigation Basics course and recounted some of his own stories from his time at Temple. Additionally, we learned that he was one of the founding members of Temple Law’s first ever Trial Team. Both judges told us about their law school experiences, their careers, and their advice for success in the legal field. They also answered questions about the judicial nomination process and discussed meeting with Pennsylvania senators. They advised our class on what they look for when selecting a law clerk and told us about their experiences working in private practice. There was also plenty of time for a question and answer session at the end. 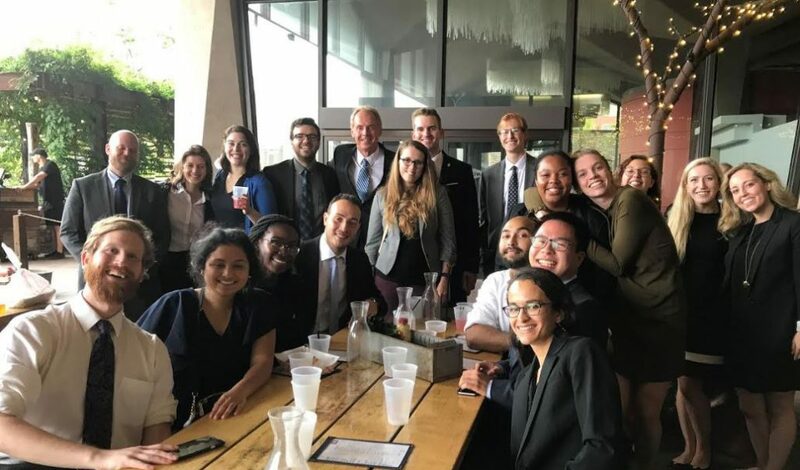 After the visit to the courthouse, Professor Jacobsen took us across the street and treated everyone to food and drinks at Independence Beer Garden. It was a great opportunity to socialize with our classmates and enjoy some time away from the law library. At the beer garden, Professor Jacobsen was open to answering our many questions both about law school and about life as a lawyer. Although it feels good to have one credit under our belts, our class will miss hearing Professor Jacobsen’s stories and wondering what pair of Yeezy shoes he will wear next. In Section 1, it’s undisputed: the “field trip” to the courthouse was the best way to celebrate completing Litigation Basics.